SEOUL (Bloomberg) -- Hyundai Motor and Kia Motors forecast their weakest sales growth in ten years for 2016 as a slump in demand in China and a stronger won cuts profits. The companies' combined deliveries will rise to 8.13 million vehicles this year from about 8 million vehicles a year earlier, Chung Mong Koo, chairman of both automakers, said during a New Year address to employees in Seoul today. That would be the slowest growth since 2006 and compares with the average estimate of 8.12 million units in a Bloomberg News survey of five analysts. 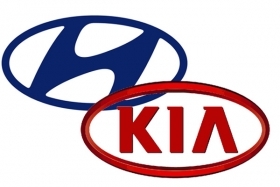 Hyundai plans to sell 5.01 million vehicles in 2016, while Kia's aim is to sell 3.12 million, the companies said in separate filings. The carmakers missed their sales target set for 2015 for the first time since 2008 after sales slumped in China and unfavorable exchange rates cut earnings in Russia and Brazil. Hyundai spun off its luxury Genesis sedan into a standalone premium brand to burnish its reputation amid flagging sales, while Kia plans to begin production at its Mexico plant in 2016 to help boost demand in the region. "The slowdown in the Chinese economy, low fuel prices and uncertainties in emerging markets due to a hike in U.S. interest rates suggest that growth will continue to be slow," Chung said in his speech. Sales in China, the largest market by volume for the two automakers, fell in the first 11 months of 2015 after demand slowed with a moderation in economic growth. Demand began to rebound after the Chinese government cut a sales target by half starting October through the end of this year. The automakers haven't released their delivery figures for December. A recovery in China, the world's largest auto market, is important for Hyundai and Kia as both companies are adding factory capacity in 2016. Hyundai will begin manufacturing at a new plant in the fourth quarter of this year and is building a fifth in Chongqing. Together, the two factories will boost Hyundai's production in China by 57 percent by 2018. At Kia, the carmaker is expanding manufacturing capacity at its third plant in China and plans to start producing its Forte compacts in Mexico in May, for export to the U.S. and countries in South America. "Sales in China should recover for both carmakers in 2016, helped by the tax cut," Kim Jin Woo, an analyst at Korea Investment & Securities Co. said. "Other issues to keep an eye out for in the year would be how well the Genesis brand is accepted in key markets, like the U.S., and how quickly Kia can bring up production at its new plant in Mexico."